A complete collection of our favourite sweet pea plants! 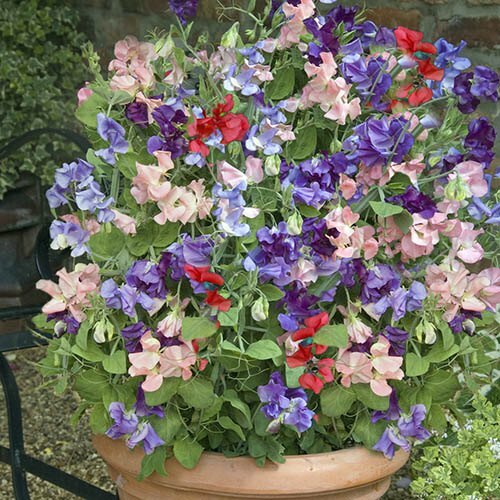 Includes 12 net pots of each; 'Fragrant Trails', 'Super Fragrant' and 'Patio Perfect'. Each variety has its own unique characteristics, from heavenly fragrance to waterfalls of trailing flowers. Perfect for hanging baskets, pots and containers, beds, borders & especially cut flowers. Supplied as a complete collection of 36 net pots - 12 each, each with at least 4 plants sown into the plug. Sweet Peas are consistently voted one of the nations favourite flowers year after year, their evocative scent and ease of growing making them so popular. Here we have created a mix of the most popular colours and shades, including many old-fashioned types, selected primarily for scent when used as cut flowers. Patio Perfect is the very best sweet pea for any outdoor pots and planters! It naturally grows to only around 2ft tall and will become smothered in sweetly scented blooms from mid June onwards bringing a fabulous mix of summer long colour to your garden. As the flower stems average around 6in Patio Perfect can also be cut and makes a lovely posy in a small vase, yet takes up little space at all. These are supplied as 4 plants in each plug - plant them as they are and do not tease apart, and you will end up with bigger and better displays. From earlier plantings before end of March, you can trim them back to encourage side branching and thus more flowers. 12 each of the following 3 varieties; 'Fragrant Trails', 'Super Fragrant' and 'Patio Perfect'. Plant whole pot - do not tease apart!